Clear, full and powerful audio that fills any room. The A5+ Powered Speakers are constructed with custom Audioengine components: aramid fiber woofers, silk tweeters, and built-in power amps wrapped in precision-tuned and hand-crafted cabinets. Audioengine speakers are special. Their traditional analog amplifiers sound incredible compared to lower-cost digital amps found in other mass-produced brands. 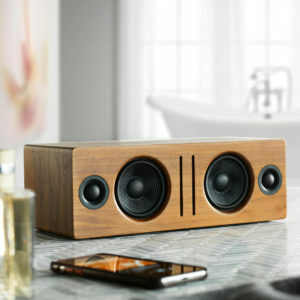 Can I have more than one thing connected to the speakers? If I have 2 inputs plugged in at the same time, how do I switch between them? Absolutely! The A5+ Classic includes multiple analog inputs. These are "open," or active, meaning there isn't any sort of switching built into the speakers; if both sources were playing while connected to the speakers, both would be audible. This makes it so you can leave 2 analog audio sources plugged in at the same time with no need to flip any switches! 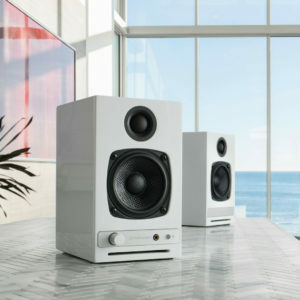 Are the A5+ Classic speakers accurate enough to serve as studio monitors for mixing music tracks? The A5+ Classic was designed with the user's listening experience in mind and are not marketed as pro audio mixing monitors. However, Audioengine has its roots in the studio monitor world and the A5+ Classic is quite good for this purpose. We've had customers tell us they use these for nearfield listening and music editing with excellent results. Does the A5+ Classic come with speaker grills? Our woofers are made of aramid fiber and the tweeter domes are silk. Both of these materials are very robust and can handle quite a bit, therefore we decided against grill covers for the A5+ Classic as they tend to negatively color the sound. Even though our speakers do not have grills they are still cat and kid-friendly! Just how easy is it to set up the A5+ Classic? Why does the volume knob on my A5+ Classic spin continuously? This is normal; the volume control for the A5+ Classic is a digital encoder, and uses a micro-processor to attenuate the volume. The light on the front of the speakers should flash as you adjust the volume up and down; once the speakers have reached minimum or maximum volume, the light will remain solid and won't flash. 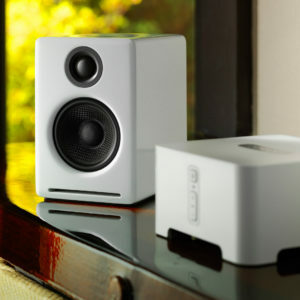 Will Audioengine A5+ Classic work with my Sonos ZP90? Sure, just connect the SONOS analog audio outputs to the A5+ Classic. Use our passive P4 speakers if you have a SONOS CONNECT:AMP. If I connect my turntable to the A5+ Classic will it be necessary to purchase a phono preamp or can I simply connect the turntable directly to the A5+ Classic input? Can I take my A5+ Classic to another country with a different voltage? Yes, just switch the voltage selector on the rear panel to match the AC power in your country before powering them on. We recommend changing the fuse when using a different voltage. For 220 volts, here's the value you would need:5mm x 20mm - 1.6 amps @ 250 volts - slow blow fuse. The power cable is detachable on our powered speakers which makes it convenient to replace the AC plug with a different type if you don't want to use an adapter plug. Should I use the volume control on the front of the A5+ Classic or can I adjust from system volume on my computer? 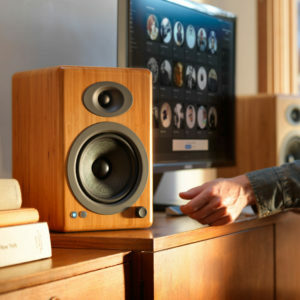 If the left speaker is in an easy to reach location, you can certainly use the physical knob to set volume. If not though, we generally recommend setting the A5+ Classic at around 50% and adjusting from source. Can I use a power inverter with the A5+ Classic? Sure, for A5+ Classic you will need about 100-120W. 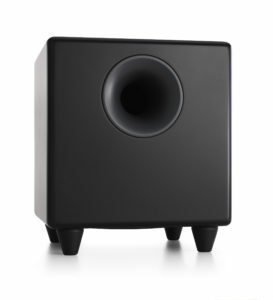 If I have a subwoofer of my own, how would I use it with the A5+ Classic? All you would need to do is connect the variable output of the A5+ Classic into the input of your sub using RCA cables. The volume control on my A5+ Classic is acting odd, or not responding at all. What do I do? If the volume control isn't working like you would expect, try turning your A5+ Classic off and then back on. Since the A5+ Classic volume control is a digital encoder, it uses a microprocessor to attenuate the volume. Like most sensitive electronics if left on for an extended period of time, you may eventually experience unexpected operation so they may need to simply "reboot". Pull the plastic volume knob off the volume pot. Depending on how tight it's on, you might be able to pull it off with just your fingers. If not, look for something fairly flat and preferably plastic with soft edges to pry it with. Use a deep well 10mm socket (or socket driver) to tighten the nut around the volume pots shaft. Press the plastic volume knob back over the volume pot's shaft, and retest. If you continue having issues after this, please open a support ticket here. Why doesn't the USB power port seem to charge my iPhone/iPad? The A5+ Classic's USB port can provide around 500mA, which is standard for high powered USB 2.0 devices; however, both the iPad and the iPhone require around 1000mA to charge with the screen on (the iPad's included USB charger actually provides around 2100mA to speed up charging with the screen on). If your iDevice is at a higher battery level it should work fine to plug it in to the A5+ Classic to maintain the battery while listening to music (with the screen on it will always show "not charging"). If the battery is low though, we'd recommend plugging it into the charger that came with it. Can I use my headphones with the A5+ Classic? You wouldn't be able to use a pair of headphones directly with the A5+ Classic; in order to use headphones with the A5+ Classic, you would need to include something with a dedicated headphone amp, such as our D1. All you would need to do is plug the D1 into your computer (either with an optical or USB cable) and connect the D1 from its RCA outputs into either of the inputs of your speakers. The volume knob won't put the speakers in sleep mode and it doesn't click when I press it in- how can I fix this? 1) Pull the plastic volume knob off the volume pot. Depending on how tight it's on, you might be able to pull it off with just your fingers. If not, look for something fairly flat and preferably plastic with soft edges to pry it with. 2) Use a deep well 10mm socket (or socket driver) to tighten the nut around the volume pots shaft. 3) Press the plastic volume knob back over the volume pot's shaft, and retest. I'd like to connect an Apple Airport Express to my A5+ Classic speakers to stream music from my Mac. I also wish to connect the speakers to my Samsung LCD TV. Is it possible to have simultaneous connections to the A5+ Classic? Will my current universal remote work with my A5+ Classic? The A5+ Classic is not officially supported by any universal remotes. It is possible to use a third party remote, but that remote needs to support IR learning. This is a feature that allows a universal remote to learn commands directly from the remote we supply. The Logitech Harmony remote, for example, is supported by the A5+ Classic. I have an Android phone that includes an IR transmitter. Can I use my phone to control the A5+ Classic? Yes! We've been notified that several Android IR Remote Apps support Audioengine remote commands. So if you have a phone with an IR blaster like the HTC One or the Samsung Galaxy S4 you can use the App to raise or lower the volume of your A5+ Classic with your phone! Simply download one of the many IR Remote Apps on Google Play, and test them out.